Elizabethan period was also peculiar for its distinct ways of life. This indeed included the type of clothing, outfits and fashion of Elizabethan society and it deserves mention. 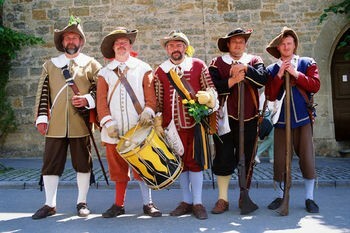 A variety of clothes like Gown, Ruff, Kirtle, Doublet, Breeches etc were used by both men and women. Clothes made of rich materials were in vogue for the upper classes whereas the common people could avail only those outfits made of basic materials. The most interesting fact about Elizabethan clothing is that the Parliament of England passed separate laws called sumptuary laws to govern the ways of dressing! It was in 1574 that these laws were enforced by Queen Elizabeth and were termed as ‘Statutes of Apparel’. It decided the types of outfits an individual should wear. The ways of clothing of a person reflected his social status, or sometimes even the colour of his cloth. Clothes with gold were reserved for the Queen and her relations. The royal class alone could wear clothes trimmed with ermine. Nobles wore clothes trimmed with fox and otter. The upper class wore velvet, satin and silk outfits. These materials were often imported from other places like Middle East. The dyes used for colouring were also so costly that the poor could not afford them. The peasants and the common man wore dresses made of cotton, leather and wool. In short, social order could be determined by clothing. Women’s outfits depended on factors like age, back ground, family and taste. The underclothes were smock, corset or bodice, stockings, roll, stomacher, petticoat, kirtle and forepart. Underclothes of men were shirt, codpiece, corset and stockings. The upper class men wore silk hats with a single feather. Doublets were worn by both men and women. Gown was a typical Elizabethan outfit. French gown, round gown, Italian gown, night gown, loose gown, Polish gown were the popular gowns. Putting on a gown was not an easy process. The first thing to wear was a smock, also called shift, the innermost layer of clothing. Next was the task of putting on stockings. Then the corset, a close fitting bodice was worn. 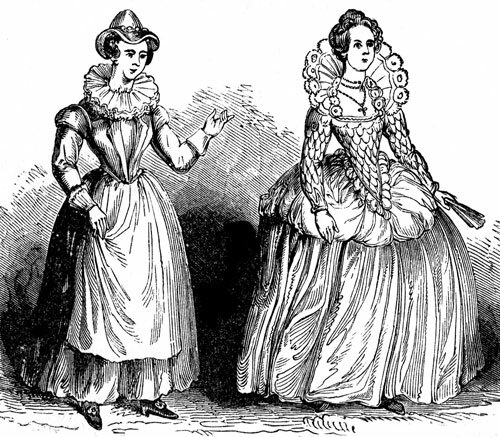 Spanish farthingales and Bum rolls were the next pieces of clothing. Kirtles and partlets were next. Then the beautiful gown was worn with matching shoes. A variety of fabrics like velvet, silk, fur were used. Slashing of colours was a peculiar feature. A mention on makeup is important. A linen cap was worn over the gown. Hair tape was also used. Snoods also gained popularity which was a kind of headdress.